What is the “Our Town” project and how did it begin? In the fall of 2009, WVIA began looking for a programming idea that would more directly involve the 22-counties comprising its coverage area in northeastern Pennsylvania and the Central Susquehanna Valley. 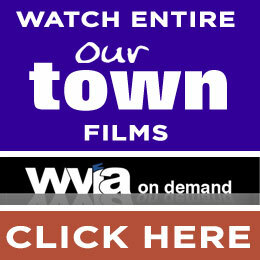 The idea we discovered was Our Town, based upon a television series created by WPSU, our public television sister station in State College. Our town adapts to television the “day-in-the-life” picture books that profile the people, places and happenings within a specific community or locale. But instead of representing these stories through still photographs, the program employs the medium of video – as shot by residents of the town or locale that is being profiled. And instead of printed captions providing narrative context, the residents who shoot the footage also serve as the program’s narrators. A town’s people know what makes their town tick. They know what makes it special. They experience their town as a home, at all times of the day, and all days of the year. With this in mind, WVIA is seeking residents within the communities selected for presentation to participate in determining the content of their Our Town Program. Through their camera lenses, a perspective of their town’s character and culture is envisioned for the viewer. Beginning in the town of Danville, WVIA turns over to its residents the role of program producers – all of them volunteering their time and talent. We are asking these collaborators to showcase their town in ways they best see fit. With the freedom of a blank tape in their own camcorder, a WVIA hat, and a lot of enthusiasm, they then go on their way. Exploring the streets, ducking into cafes, or listening to the high school band, viewers are treated to the many personalities, perspectives, and possibilities their town offers. Attending weddings and anniversary celebrations, their town’s stories and secrets are unlocked before the viewer’s eyes. In capturing the experience of community life from the vantage point of the people most invested in their community, WVIA intends Our Town to involve the public more intimately in the station’s programming. The series aspires to inspire in viewers a sense of pride and of its place in the constellation of communities that reflect the quality of life in northeastern Pennsylvania and the Central Susquehanna Valley. For shooting tips, click here . Would you like to see your hometown in the Our Town series? Let us know in the comments below what makes your town so special, and we will consider it when planning future projects!